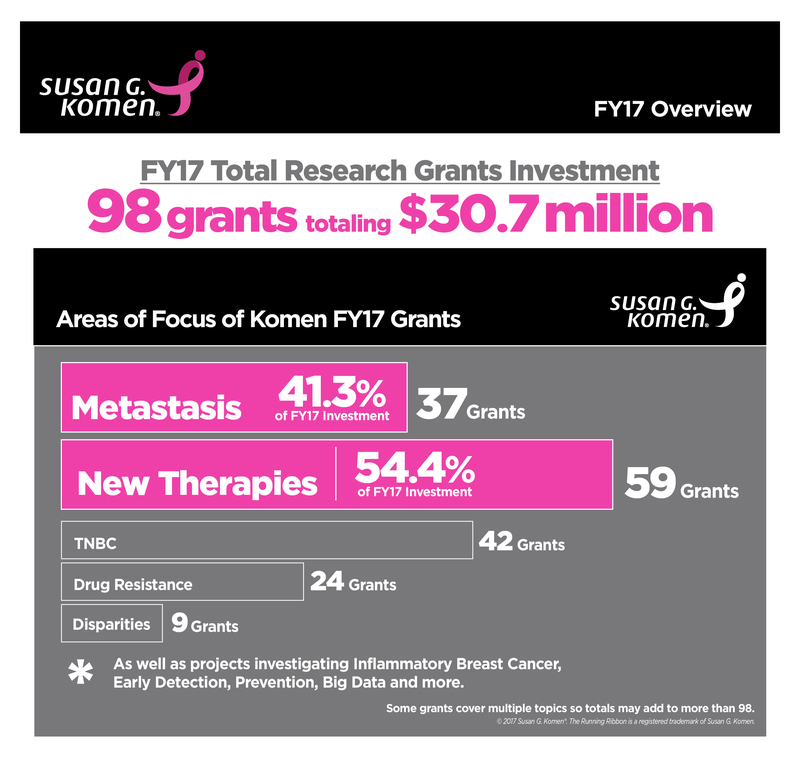 DALLAS – September 26, 2017 – Susan G. Komen, the world’s leading breast cancer organization, today announced 2017 research funding of $30.7 million for 98 research grants, with a focus on new treatments and understanding of the most lethal forms and stages of breast cancer. Komen funding to institutions in 27 states and seven countries also includes research into new screening technologies, treatments for metastatic and aggressive types of breast cancer and disparities in breast cancer outcomes. The grants include $2,550,000 in new funding for research at two institutions in Indiana, bringing Komen’s total research investment in Indiana to $29,638,931 since 1982. Metastatic breast cancer – which is breast cancer that has spread to other parts of the body like the brain, liver, bones or lungs – is responsible for almost all the nation’s 40,000 annual breast cancer deaths. More than 154,000 women are living with metastatic disease in the U.S. today. By targeting metastatic disease, Komen is hoping to reduce breast cancer deaths dramatically in the U.S.
* Numbers add to more than 98 because individual studies may be classed in more than one category. Since 1997, Komen Central Indiana has contributed $7,762,650 to breakthrough breast cancer research. “We are so thankful for the friends, family and neighbors that fight alongside us, helping to reduce the number of breast cancer deaths in Indiana, locally and through research,” said Nikki Mazelin, Komen Central Indiana interim executive director and development director. Komen Scholar Sunil Badve, M.D., will receive $250,000 to understand how RNA controls genes in breast cancer and how this leads to therapy resistance and metastasis. This work will also determine if certain drugs used to treat hypertension could be used to treat triple negative breast cancer (TNBC) that remains after chemotherapy. Ultimately, this work should lead to the development of new strategies to address treatment resistance and metastasis. Komen Scholar Harikrishna Nakshatri, Ph.D., will receive $700,000 to better understand the molecular mechanisms involved in ER+ breast cancer growth and recurrence. The goal of this work is to develop new combinations of therapies using drugs that are currently being used in the clinic to treat ER+ breast cancer. Komen Scholar Bryan Schneider, M.D., will receive $600,000 to continue his research to understand why some patients suffer chemotherapy-related side effects, such as peripheral neuropathy and therapy-induced heart failure, while others do not. Dr. Schneider will review genetic information and lead a clinical trial to find the underlying cause of these toxicities and develop preventive therapies. Indiana University will receive $550,000 to support the Susan G. Komen Tissue Bank (KTB) at the IU Simon Cancer Center, the world’s only biorepository of normal breast tissue. This grant supports the collection and storage of whole blood, DNA, serum, plasma, and healthy breast tissue from women not known to have breast cancer, as well as the distribution of the samples to researchers worldwide. The availability of such normal tissue has the potential to revolutionize the understanding of changes that happen in a normal breast and how these molecular mechanisms are altered in the malignant process. Sueng-Oe Lim, Ph.D., will receive $450,000 to study how to enhance the immune system’s natural ability to fight breast cancer through a protein called PD-L1. Attempts to target this molecule have been difficult due to changes to the protein by the addition of sugars. By controlling the process of sugar additions to the protein, they propose to increase the effectiveness of PD-L1 treatment. Indiana also has three ongoing grants, awarded in previous years, including a grant to Komen Scholar Kathy Miller, M.D. In the fight to end breast cancer, we are central Indiana’s locally led and empowered affiliate of Susan G. Komen®—a global organization whose name is synonymous with the cause. Susan G. Komen is the world’s largest breast cancer organization, funding more breast cancer research than any other nonprofit while providing real-time help to those facing the disease. Susan G. Komen Central Indiana works locally to improve outcomes for those facing breast cancer throughout 41 counties in central Indiana. For more information, call 317-638-2873 or visit komencentralindiana.org. Connect with us on Facebook, Twitter (@KomenCentralIN) and Instagram (@KomenCentralIN).